Jason Cowie - along with his father Jim - purchased Wingers Cabinets in June of 2008. Since it was established in 1982, Wingers Cabinets has become well known and well respected for its quality products and attention to detail. And since Jason Cowie - along with his father Jim - purchased the company from Gord Winger in June of 2008, he has built on that reputation and grown the company into a multi-million dollar business. Cowie has always been entrepreneurially inclined and has previously been involved in several other businesses. So when company founder Gord Winger, approached him to see if he wanted to buy his company, he didn’t hesitate. The company was much smaller then, just a 4,000 sq. ft. shop with seven employees, but it was close to home and since he liked the company reputation and the quality they were producing, Cowie pursued the acquisition. “I was 25-years-old at the time and I was trying to figure out what I wanted to do next. I thought this was a great opportunity,” he says. Now, in 2018, that statement holds true, but it didn’t start out that way. The 2008 recession hit right after they signed on the dotted line and Cowie says for a couple of years it was a real struggle to keep things going. But they persisted and slowly grew the company. Wingers Cabinets was and still is located just outside Hagersville, Ont. - in fact you can see their old shop just around the corner from their new facility. Given his business experience, Cowie knew that if he wanted to grow the company he had to focus on and expand into larger markets. “We do high-quality custom work and our product is very different. “We build mostly face-frame cabinets made from solid wood, using top quality Canadian materials. We use formaldehyde-free birch veneer core interiors and with dovetail drawer boxes and soft-close everything,” Cowie says. So, in order to expand the business, first into the Niagara Region, they added a second showroom in Fonthill and more are planned. “Today we serve the Niagara area, Hamilton and Ancaster, as well as Burlington, Oakville and the GTA. And we do a lot of work with homebuilders, architects and designers” he says. Their plan worked and as they business grew, and having already expanded their old facility once, it was time to find a larger building. They found it - just around the corner - and in 2016 Wingers completed the move into a new, much larger, 20,000 sq. ft. space. The company employs 25 people now. Over the years keeping up with demand meant updating in-house methods, to computerized programs as well as adding an automated spray line. When they moved into the new building, Wingers was equipped with an entirely new set of fabrication equipment and spray booths. 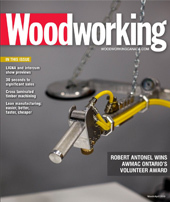 From table saws, to edgebanding, sanding, dust collection and dovetailing equipment the new shop was set up to produce. “The only thing we kept was an old Altendorf table saw, but we also bought a couple new table saws because we needed more capacity. 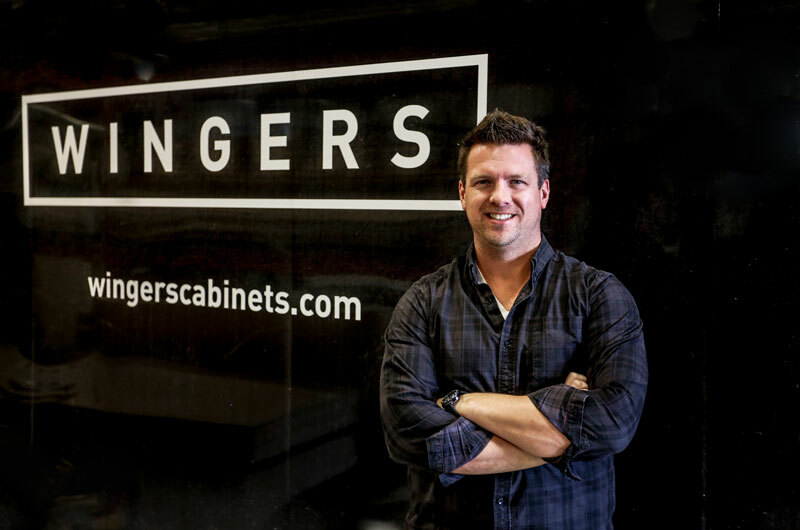 Wingers is hoping to expand their product range and be able to offer a high quality frameless cabinet line as well. And in order to add that capability, Wingers will likely invest in a CNC machine. Operations Manager Mark Doyle says the thing that makes the company great, is the teamwork and the excellent employees they have, many of whom have been with them for many, many years. There is also a lot of employee engagement via roundtable-like meetings. “A lot of people have a lot of good ideas and we are always looking for their input, so we ask everyone to participate and share their ideas for how to make things better,” Cowie said. Everything we do is custom, there are no standard sizes, it’s whatever people want and for any room in the house,” he says. Obviously, cabinets are there to provide storage, but more importantly they add hugely to the look and feel of a home and the team at Wingers knows that and puts a priority on good design. Doyle said people come to them with ideas and measurements, but it is up to the team to turn that wish into reality. Some designers simply send us their plans and selections, we fabricate, install and service, basically we provide an entire back office so they can focus on their business and their customers. Most people, who think of cabinets, think of the kitchen. But cabinets can be useful in many rooms in the home, from bathrooms, media rooms, living rooms, bar areas and much, much more. And at Wingers they build the right cabinet for every room in the house. They also offer a variety of countertops to choose from, including Cambria quartz, granite and high definition laminate and unlike the usual industry standard where set sizes may limit what customers can do, Wingers has no set sizes and everything is custom - from cabinet sizes to finishes - which allows them to provide completely custom cabinetry and yet remain priced competitively. Wingers encourages customers to come to their showroom and meet with a kitchen designer. That’s the time to get inspiration and visualize what is possible. Bringing photos and a bit of a wish list is always the best way to start the process of designing a dream kitchen and it will be a quality product that’s built to last. From stunning designs to professional installation, customers can count on Wingers Cabinets to provide the utmost quality and service every step of the way.